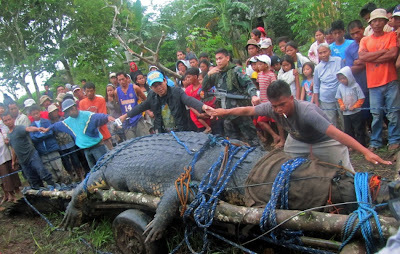 This week one of the largest crocodiles ever discovered alive was captured in the Philippines. At 6.4 metres long and over 1000kg's in weight, it puts the most well authenticated previous "largest croc" record of 6.2 m (shot in the Fly River, Papua New Guinea in 1980) in the shade. 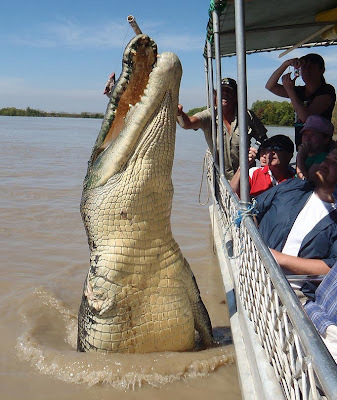 The Guinness Book Of Records states there is a 7 metre long crocodile in the IndianBhitarkanika national park, so perhaps there are even bigger monster crocodiles out there. Sadly, as you can see in the picture above, the Filipino crocodile hasn't been treated with the respect it deserves and will now be hauled off to spend the rest of it's life in captivity. I'm hoping for a Rise of the Planet of the Crocodiles type break out in a few months time. 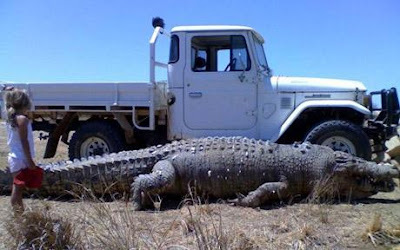 When a picture of Brutus, a mere 5.5m long saltwater crocodile from northern Australian, surfaced earlier this year there was a great deal of controversy over whether it was even real or not.